The new cookbook, Herbal Market, published by the Maumee Valley Herb Society is now available. This is a collection of 180 recipes submitted by members and friends of the society. All include herbs in their ingredients.The recipes are placed in a 7X9 inch three ring loose leaf vinyl covered binder. They are arranged in fifteen sections each divided by a title page which lists interesting facts about the specific herb featured in that section, a tip for cooking with herbs and an original drawing of the herb for identification. A nutritional analysis, per serving, is supplied for each recipe. Topics include Starters, Soups, Salads, Entrees, Vegetables and Desserts. An additional division features twelve recipes for bath and beauty products developed with the use of herbs. The book includes an article written to encourage the reader to consider planting an herb garden at, “Your Kitchen Door”. It is designed for entertaining reading and easy use. A great gift for you and others. The cost of Herbal Market is $15.95 plus tax, $1.16, total $17.11. It can be purchased by mail. Please add $5.00 per book for shipping and handling and address the order to Maumee Valley Herb Society c/o Toledo Botanical Garden, 5403 Elmer Drive, Toledo, Ohio 43615. Checks should be payable to Maumee Valley Herb Society. 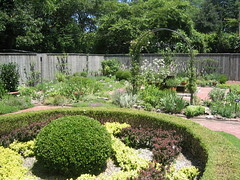 Proceeds support the Herb Garden at Toledo Botanical Garden. This book is divided into five sections. The first section, Super Herbs, profiles the authors’ choices of twenty super herbs. Their list includes Basil, Bay, Chamomile, Chervil, Chives, Cilantro, Dill, Fennel, Garlic, Lavender, Lemon Balm, Lovage, Mint, Oregano, Parsley, Rosemary, Sage, Sorrel, Tarragon, and Thyme. Gardening with Herbs suggests various ways to grow herbs both indoors and out, such as planting herbs among vegetables, making herbal hedges, growing herbs in containers, and other ways to add herbs to your garden. Living with Herbs discusses making such items as potpourris, sachets, pomanders, and a winter wreath. Herbs are used to provide a pleasant aroma to a log fire, as decorations throughout the home, in making cleaning products, and bath and body products. Cooking with Herbs includes recipes for vinegars, dressings, oils, butters, appetizers, snacks, entrees, salads, desserts, and beverages. The A-Z of Herbs discusses more than 70 herbs and tells the height and spread of each, the zones they grow in, and culinary uses for each herb. This book is beautifully illustrated and I believe you will find it a good read. John Rogers’ Copper Trellis uploaded by herbgardener12.